Brandon Nimmo of the Mets after hitting his first career home run, a three-run shot, during the fourth inning against the Cubs. James Loney and Asdrubal Cabrera created a flash storm of home runs in the second inning of the Mets’ game against the Chicago Cubs on Friday night, sending back-to-back fly balls toward the clouds and over the right-field wall at Citi Field. Moments later, the actual rain began, causing a 68-minute delay. Though the weather remained a nuisance throughout the game, the Mets’ bats did not go quiet. 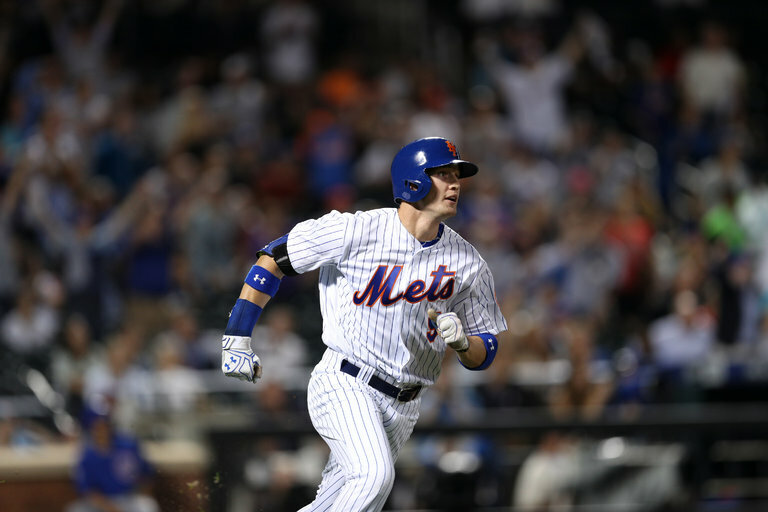 Brandon Nimmo hit his first career home run, a three-run blast in the fourth inning, after Loney had capped a two-out rally the inning before, driving home Neil Walker and Yoenis Cespedes with a double into the left-center-field gap. Nimmo, Cabrera and Loney had three R.B.I. apiece, and the Mets pounded the Cubs, 10-2.